We have become passionate advocates for young adults living with MS, parents, and caregivers. It seems to me that tragedy has a strange way of bringing people closer to their purpose. Whatever it was, it happened to older people. Rushing out the front door with my high school teenage daughter after fixing breakfast, walking the dogs, filling their silver dog bowls, and somehow finding time to put make up on and prepare for a full day as a director of a high-end salon was my typical Monday-through-Friday routine. It was Thursday, Dec. 8, 2011. It was anything but routine. It is the one Thursday I will never forget. My daughter, Breea, needed to use my car to go to her first collegiate cheerleading training class after school. She dropped me off in front of my work and disappeared down the street. I took a deep breath and tried to mentally focus on the day of work ahead. By 6 p.m. she was at the front door to the salon and barely able to walk. The next day I was staring at a brain MRI. Her brain. The white area that was not supposed to be there was enormous. Her condition continued to deteriorate. She could not talk or swallow, was now blind in her left eye, and was completely paralyzed on her left side of her body. The diagnosis: acute sudden onset of tumefactive MS. I was in complete disbelief that a disease I knew so little about, and that what I did know didn't add up to what I was witnessing, was taking over my only child's life. Her doctor kept telling me this was a rare and catastrophic onset. At first he wasn't even sure he could categorize it as MS. That word "catastrophic" would echo for days in my mind and led me to the hospital computer room, where I began my research on this mysterious disease. I ended up absorbing tons of information and medical facts about MS. I learned that it affects 400,000 Americans, and more than 2 million people globally. I learned that it is an autoimmune disease that attacks and destroys the protective covering on the nerves in the brain and spinal cord, called myelin. I learned that when the damage is done to the actual nerve itself there is no way to repair it. I learned that most living with MS never have to use a wheelchair. They never become disabled from the disease. Onset typically occurs in the 20- to 50-year-old age group. Multiple sclerosis affects women much more frequently than men. I discovered books and support groups for those living with MS and kids who have parents living with MS.
What I didn't find was support for me, a parent of a teen with severe MS, and even less support for Breea. At least I could talk to people my age with the disease and get some information out of a conversation that I could possibly apply to our situation. Even then, I was a parent with a child who had been stricken so violently with a catastrophic onset. She was the teen lying in a bed helpless to a disease that, from most accounts that I read about, affected people my age. Will she graduate? Will she ever walk again? Will people accept her like this? Will she accept herself? Will she cheer again, go to college, ever be able to have children... the list went on and on. According to Breea's doctor, less than 1 percent of all those with MS have the kind that Breea has. Most never experience what Breea has had to endure. But recent anecdotal reports from the U.K. show that MS is showing up in kids as young as 5 years old. Pediatric MS now makes up between 2 percent and 5 percent of the population of those with MS. According to the National MS Society, the earlier the onset, the more likely one is to accumulate significant disability at an earlier age compared to those with adult onset of MS. It appears to be creeping into the lives of a much younger population. Why? The medical community has no idea... yet. Still, these facts don't really support my daughter's type of MS. She didn't experience the typical slow onset, minor symptoms, no disability. She experienced the worst of the worst, and with all the research I did, and eventually began to include her in when she was ready, we never really found anything to help her via a support group or even one person her age to talk to so she didn't feel so alone. We became each other's support, each other's comic relief, each other's sounding board and shoulder to cry on. We were, in a sense, in this together. The other aspect I did not find much information about is the emotional and social impact a disease of this nature can have on a young adult. The emotional and social impact MS has had on my daughter has been nearly unbearable at times. She became the girl in the chair at school, the one people stared at at the movies, the one who wasn't sure if she would ever be what she considered to be normal again. 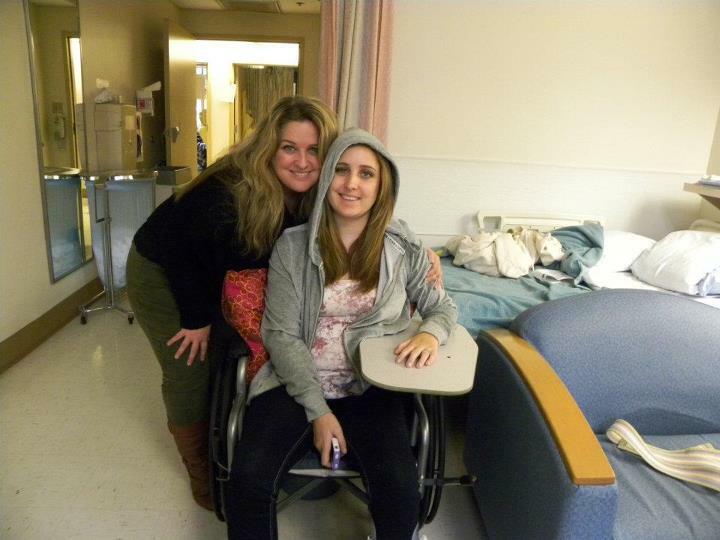 She went from being a cheerleader to not knowing if she would ever walk again in one day. Not from a car accident or sports injury. She wasn't doing anything to cause this ,and there was nothing she could do, a decision she could make, to stop it. But there was something else happening inside of her that was as mysterious as the disease attacking her brain. It was her resiliency and ability to gain insight through it all that began to shine through. I began to see the years of resiliency developing habits and choices I had made as a single mom shine through in her character as she chose to stand tall and take one step forward at a time. She told me once that she used to be on the other side of making remarks about people with disabilities. She wouldn't be doing that anymore. She told me she thought she knew who her friends were before; now, she knows who they really are. She told me feeling sorry for herself would not heal her lesions, but focusing on her dreams would give her the strength she needed to be the best she could be. The lessons just kept on coming. She told me she would graduate with her class. She told me she would walk again. She told me she would still go to college. She did them all. Today Breea is still in a leg brace and working hard to gain all of her strength back in her arm and leg. Her vision is perfect. Her cognitive skills are getting better, and she is starting all over again when it comes to cheer. She recently did her first backbend with me there supporting her. It was a pretty special moment. Another special moment was when we were asked to give a presentation for the National MS Society-Pacific South Coast Chapter. We have become passionate advocates for young adults living with MS, parents, and caregivers. It seems to me that tragedy has a strange way of bringing people closer to their purpose. Yes, we were blindsided by MS. I lost my job while on medical leave and lost the daughter I used to see running and cheering and tumbling. She lost her ability to walk normally and now lives with the reality of being diagnosed with this frightening, unpredictable disease. But we never lost hope. We never lost sight of how important love and laughter is. We never stopped being creative in our approach to recovery and therapy. We never gave up and today, with research being done via stem cells and other advanced medical technologies, we will never stop believing that one day there will be a cure. For more by Michelle Renee, click here. For more on multiple sclerosis, click here.